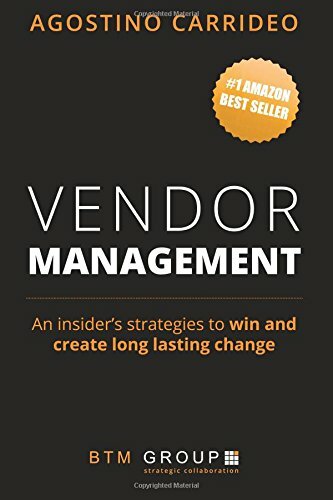 If you’ve said any of the following, then this book is for you: “We have hundreds of vendors — this will take forever!” “I have no idea who our vendors are or what they’re providing” “My current process is too manual & time-consuming” “Excel can no longer handle our needs" “We need executive summaries to share with management & auditors” “We need documentation on all our vendors and contracts” “We lack a systematic way of assessing vendor risk” “We don’t have a formal vendor review process” "It's a nightmare!" If you've been saying any of these, then you are yet to find the missing link... It's Culture. Great cultures power great vendor management. Read this book to find out how. Agostino has over 20+ years experience in the area of strategic vendor management working in technology, telecommunication, financial, energy, management consulting, mining, and aviation industries. His passion has been to develop vendor management capabilities for businesses, implement various initiatives across the vendor management life-cycle and foster a collaborative culture that exceeds results.